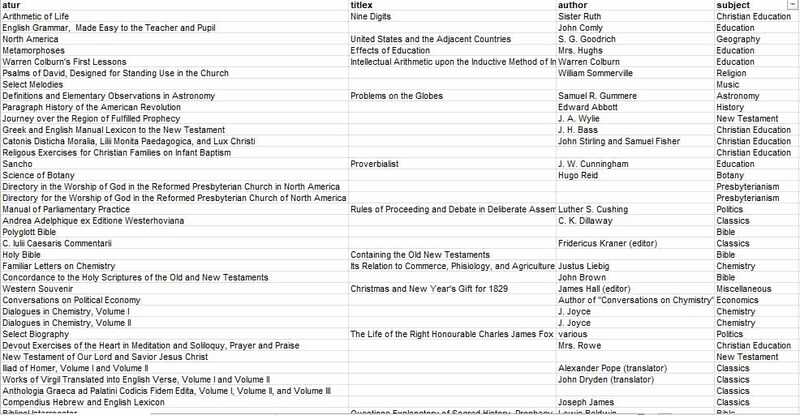 Description This spreadsheet lists all of the books in Theophilus Wylie's personal library still existing in the Wylie House Museum. 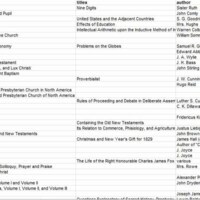 In addition to author and title, the dataset categorizes books and visualizes subject categories within the library. Also included in the datset are some comparisons between T.A. Wylie's personal library, the Indiana University Library, and some purchases Wylie made for the university library. Shawn Martin , “T. A. Wylie Library Dataset,” Wylie House Exhibits, accessed April 19, 2019, http://collections.libraries.indiana.edu/wyliehouse/items/show/32.